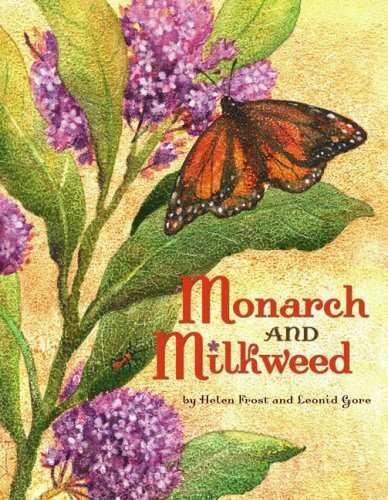 If you are looking for a book about caterpillars turning into butterflies, you want nonfiction but artistic and poetic, Monarch and Milkweed, by Helen Frost, is for you. Featuring beautiful illustrations by Leonid Gore, the wording takes this nonfiction title to a different level. jade green, specked with gold. At the end is a summary of the migration and an expansion of the text  for instance the fact that each species of butterfly has one kind of plant on which the butterfly lays its eggs, like monarch and milkweed. The book also points out a monarch website for more information. Classroom teachers, librarians, and parents may want to pair this book with an even simpler version in a picture book, Arabella Miller’s Tiny Caterpillar, by Clare Jarrett, which features bright illustrations, rhyming text, friendly characters, and factual information at the end. I’ve heard that the monarchs have been AWOL this year, and I have to admit that I haven’t seen them around. We have a Butterfly bush in our garden, but I’ve seen mostly Eastern Tiger Swallowtails (yes, I looked it up) and not even that many of them. First the bees disappear, then the butterflies. What’s next? Roaches? Oh, actually that would be okay.